It’s Firm Ground Here…is a video-based work that documents and literalizes the ways in which we wrangle with the tension of racial or cultural identity. Within my performance and video-based practice, I view open and closed public spaces, private spaces that seek to function as publics and exclusive spaces (women only, people of color only, queer only, activist spaces, artist spaces) as source material. My practice considers both the discourse of Publics and Counterpublics while also thinking about the work of sociologist Harold Garfinkel and his breaching experiments of the 1960’s, as well as the effect these types of work had on social justice organizing and educational theatrical pedagogies such as Augusto Boal’s Theatre of the Oppressed. Using various interviewing, facilitation and theater techniques, I inquire about our abilities as activists or otherwise concerned people to project what we intend to into the world. This body of work builds upon my investigations into decentered performance as a way to highlight our internal public and private spaces. In particular, I have looked to people within my social, political and artistic circles who both wrestle with a personal ideology as a race traitor, to those who have selectively determined that they wish to eliminate whiteness from their lives. The people chosen reflect those within proximity that I have intercepted within the last 15 years and in some cases were active and present in late 90’s/early 2000’s WTO and anti-globalization movement work. As a group, several of these participants also self identify as children of late 60’s activists including white anti-racist organizing along with the yippies, crazies groups etc. Within my project, I have sought to look for possible questions and/or relationships between these various groups. As a process, I informally and formally interviewed 20-25 members of various communities that I range in emotional closeness to. The initial interviews were not traditionally documented though I took notes, did drawings and in some cases, took photographs with each person, in an attempt to understand where we place ourselves now, whether they felt they were in opposition to where they came from and in some cases were point blank asked if they felt they were race traitors. This portion of the project focuses on one interviewee named Jessica. 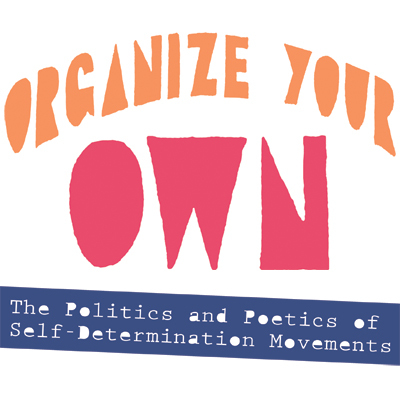 “Organize Your Own: The Politics and Poetics of Self-Determination Movements” is a exhibition and event series that started in Philadelphia and Chicago in early 2016 and is now traveling to other cities. OYO features new work by contemporary artists and poets that responds to the history of the mandate from the Black Power movement to “organize your own” community against racism. Rashayla Marie Brown, Emily Chow Bluck, Salem Collo-Julin, Irina Contreras, Amber Art & Design, Brad Duncan, Bettina Escauriza, Leviton Gallery, Paul Gargagliano, Thomas Graves, Robby Herbst, Jen Hofer, Maori Holmes, Aletheia Hyun-Jin Shin, Asian Arts Initiative​, Kelly Writers House, University of Louisville Anne Braden Institute for Social Justice Research, Marissa Johnson-Valenzuela, Valerie Keller, Billy Keniston, Jennifer Kidwell, Lisa Yun Lee, Josh MacPhee, Jenn McCreary, Fred Moten, Matt Neff, Mark Nowak, Edward Onaci, Dave Pabellon, Mary Patten, Rasheedah Phillips, Works Progress with Jayanthi Kyle, Anthony Romero, Frank Sherlock, Slought, Amy Sonnie, Jennifer S. Ponce de León​, Nato Thompson, Hy Thurman, James Tracy, Daniel Tucker, Dan S Wang, Jakobi Williams, Mariam Williams, Nicholas Wisniewski, Rosten Woo, Wooden Leg Print & Press, Rebecca Zorach, Maria Gaspar, Nicole Marroquin, Eric J. Garcia, and more!